Gird your loins fashion aficionados cause January award season in now in full swing and it’s high time for a little change of format going forward. 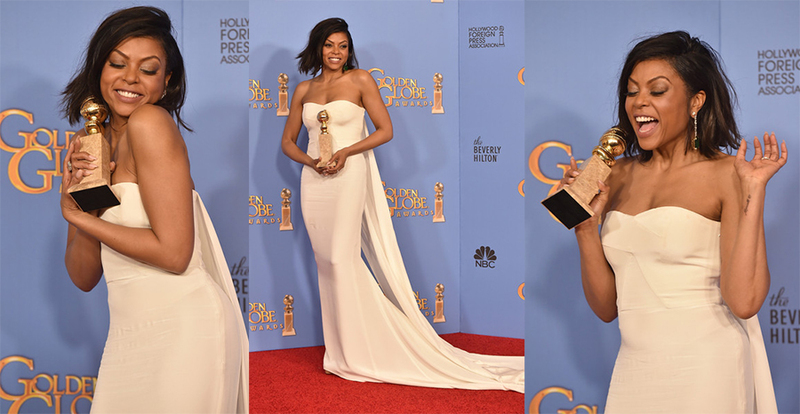 If there’s one woman who ferociously stole the show for me was the phenomenal Taraji P Henson. The Empire actress picked up the Best Actress in a Drama Series, for her role as Cookie Lyons, whilst hilariously fighting back valiantly against the ‘wrap up’ music. She looked heavenly in an ivory white Stella McCartney caped gown accompanied by beautiful, simple jewelry by Kimberly McDonald. The look was fresh, clean and oozed power (much like Taraji herself). Gaga was ON IT at the Globes, as she accepted her first big acting award for her role as The Countess in American Horror story – and her speech? Beautiful and moving. Brava Gaga! Much as been said for Lady Gaga’s fashion choices over the years, but she sashays onto the red carpet wearing a beautiful off the shoulder velvet Versace gown. It’s classic shape paired with her Monroe-esque blonde hair harked back to the screen sirens of the past. It was a look worthy of a Golden Globe winner! As expected with awards show season big and bold princess gowns are a staple choice for many women who walk the red carpet. This was no exception for the next two ladies, who choose to rock looks on the two sides of the princess spectrum. First up Blindspot actress, Jamie Alexander, who opted for a emerald green gown, by Italian designer Genny with a plunge neck, and dazzling jewels to boot! I adore the rockstar edge of this entire ensemble with her smokey eye make up and the art-deco-esque print on the skirt of the gown. Working a more elegant look was the second time Globe nominee Gina Rodriguez, who wore a off the shoulder Zac Posen number in a beautiful deep navy blue. As always my favourite thing about Posen’s designs for the red carpet? Pockets! Yay for practicality. Gina styled her look equally exquisite Neil Lane jewels. And finally ending with one of the ladies who presented Taraji with her award. Proving that all that glitters is not necessarily gold, but pink, was the statuesque Kate Bosworth. By far my favourite couture piece on the red carpet, this Dolce & Gabanna gown is an exercise in refined excess. Just look at the stunning sequin details! With a dress like that Kate kept her styling simple and fresh, save for showstopping diamond earrings by Norman Silverman! Let me know what your favourite moments were in the comments below! Who were your favourites from the night?